One of the areas in which I have been able to explore these questions has been food and drink. And I have to say, it’s been the most fun. As coordinator of the popular Nature Nocturne events, I am working with one of our chefs, Karly Ireland, to plan a menu for our series finale that will really glow. While bioluminescence is about organisms that create their own light, these food items will only fluoresce under special light (still a very cool experience!). So, what food and drink will glow under black light? Turns out Karly has been doing some experimenting. And a note for those of you eager to try this out at home, not all black lights are the same wavelength, so results will vary depending upon the light you have. Our discussions started with the easy one—tonic water. 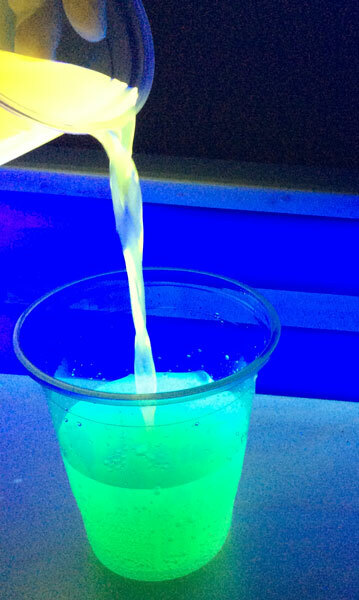 One of the elements in tonic water, quinine, glows bright blue under black light. So drinks made with tonic water will glow. Cool! What else can we use? It turns out that certain vitamins glow under black light as well. Vitamin A and some B vitamins (thiamine, niacin and riboflavin) glow bright yellow. This means sports drinks and some fruit juices are options, too. And then the big surprise: Chlorophyll glows bright red under black light! So all those yummy salad greens will turn red, depending upon how many other elements are in the vegetable. So how does this all work? Well, black light emits light in the ultraviolet (UV) range. This light has short wavelengths and high energy, which means it easily penetrates surfaces. This is how sunburns happen, but that’s another story. In some materials, the energy from UV light excites their molecules to a point where they emit their own wavelength of energy as light. The colour of the glow has to do with the wavelength, or amount of energy, that the returning light has. So glowing food, in this case, is not toxic or dangerous as Hollywood might have us believe. It is only food showing off its talent for absorbing and re-emitting light. Be sure to join us on Friday, May 23 for Nature Nocturne (the best party “glowing on” in the nation’s capital). Enjoy the rare opportunity to sample a fun selection of food and beverages that will light up your taste buds! This entry was posted in Education, Events, Exhibitions and tagged Glow, glow-in-the-dark, glowing food. Bookmark the permalink.